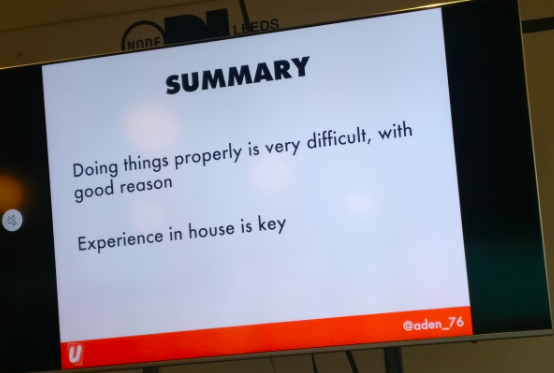 Last Friday I spent a day in Leeds, attending Product People North. It was a nice excuse to go and see dxw digital’s new second home city, and also gave me the opportunity to catch up with some people I haven’t seen in a while and meet some new ones too. I like events like this – they remind me that my day to day product struggles are not mine alone, and give me a useful nudge to approach a problem differently or take a different perspective. The morning was spent hearing from two presenters. The first was Aden, from UAccount. He told us about their work to provide banking to people who are credit impaired, and a bit about what that means. I didn’t know anything about UAccount before hearing from Aden, and I hadn’t given much thought to how credit impaired people access banking services that lots of us can take for granted. Aden prompted us all to reflect on our privilege if we’d never needed to think about this. Aden’s presentation was about his organisation’s efforts to learn from and reuse GDS principles and approaches to find out more about their users and drive the next iterations of their product. Throughout the presentation, Aden’s passion for his work and empathy for his users was palpable, and that made it a really compelling thing to listen to and think about. Some of what Aden said about his expectations before embarking on this new approach really struck a chord, and reminded me of the talk Will Myddleton gave at UX Brighton which I’d watched on the train up. Many of the achievements GDS has made have been grounded in a firm commitment to starting with user needs, but this can make them seem like the magical potion that makes all your services usable, accessible, and delivered at pace. The reality can be much fuzzier, and some of that mythology around user needs can obscure the effort it takes to interpret raw research findings into those user needs. After Aden, we heard from Celine McLoughlin about Data Jam North East. I was pretty excited about this, as I was quite disappointed not to be able to attend that event myself. Celine gave a really honest and considered account of collaboration across teams, organisations, and even sectors. She also shared some of the thinking behind the event and why and how it arose. 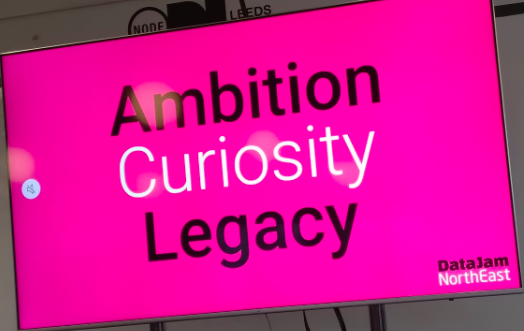 There were lots to recognise in her realisation that some of her closest collaborators for the event were part of her organisation and even in the next building, and it was great to hear about a OneTeamGov micro action blossoming into this wonderful new thing. I think there was also a lot to take away from how they approached naming the event to make sure it would include everyone taking part, including academics, social care organisations, and charities, as well as reflecting the regional breadth of attendees without obscuring its very deliberate location! I went into lunch with lots to think about. In the afternoon we had a lean coffee session based around topics that participants had suggested during lunch. I joined a conversation about value and what we mean when we refer to ‘the business’. 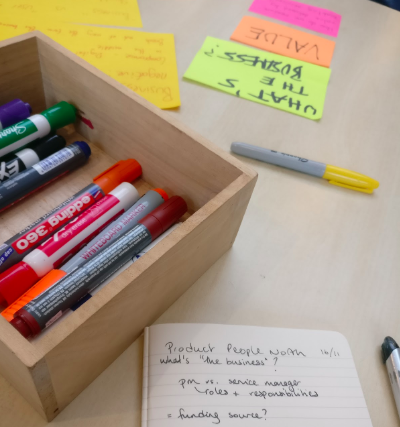 The two things are linked, and we had a really interesting and open conversation that covered a lot of the challenges that come with product management in the public sector. We talked about ‘the business’ as a sort of boogeyman, the anonymous source of our own hypothetical concerns that can sometimes give us an easy way out of tricky or risky decisions: “well we could make a case for replacing the legacy system, but The Business won’t like it”. We also acknowledged how often this framing can be used negatively, and how rarely it’s a positive. One way I think we can start to change this is through openness. As product teams, we’re making trade-offs all the time, evaluating the value and effort of things, as well as their potential impact (positive or negative) on our teams and the people we work with. Making those trade-offs more transparent to those we might consider ‘the business’ is a really good step towards bridging the gap that emerges between ‘them’ and ‘us’ whenever we use that framing. I also think we can be more open about what we don’t know. Working iteratively and with continuous user research and analysis means that the list of things we know we don’t know is often just as long as the list of things we do know, or have data about. Being open about the things we’d like to learn about is an important part of helping a delivery team focus their efforts and understand where their risks are, which is why we include the things we’d like to learn or prove in our roadmaps. But being even more open about these unknowns by sharing them with stakeholders outside the delivery team and the safety of digital teams can help to shed light on them. Speaking to people in other teams might help you find creative ways of gathering data or insight about those things that you wouldn’t be able to get by measuring everything in your product that moves and hoping some meaning pops out. Product People North was a great event: open, collaborative and creative. I had interesting conversations with lovely people, and left with a head full ideas and things to think about. I’m already looking forward to the next one. Think your comments about “the business” are insightful. Transparency can be a great way to break down barriers and allow our teams to be open about the risks they need to take in order to make progress.